China on Thursday repeated its claim over the Spratly Islands after Malacañang slammed the persistent presence of Chinese vessels in the West Philippine Sea. 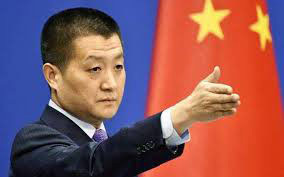 “The Nansha Islands are China’s territory, which is backed by sufficient historical and jurisprudential evidence,” China’s Foreign Ministry spokesman Lu Kang told reporters in Beijing. Lu made his statement after Presidential Spokesman Salvador Panelo said the Philippines would always assert its sovereignty over the Spratlys in the wake of a report on the presence of Chinese vessels on Kota Island aside from those in the waters off Pag-asa Island. • Filipino and US troops held the last major exercises on Lubang Island in Occidental Mindoro on Friday to test their skills in repulsing foreign invaders. • The ability to retake an airfield captured by the enemy is an essential part of fighting terrorism, said Lt. Gen. Gilbert Gapay, Philippine “Balikatan” exercise director. • The just-concluded “Balikatan” exercises highlighted the need for mutual cooperation in today’s complex security environment, said Armed Forces Chief of Staff Benjamin Madrigal Jr. He made the statement in a speech during the closing ceremonies for the annual joint military maneuvers of the AFP Commissioned Officers’ Club in Camp Aguinaldo in Quezon City. Madrigal said the yearly “Balikatan” exercises were one of the military’s measures to test strategies in combat operations. *The annual ”Balikatan” exercises have always been fruitful for all participating militaries, Brig. Gen. Edgard Arevalo, AFP spokesman, said at the sidelines of the closing ceremonies for the 35th “Balikatan” in Camp Aguinaldo. About 4,000 Filipinos, 3,500 Americans, and 50 Australian troops participated in the exercises that began on April 1. But he said it was China’s consistent belief that the disputes surrounding the South China Sea should be resolved through negotiations between China and the concerned countries including the Philippines. “We are committed to upholding peace and stability in the South China Sea in concert with other regional countries,” Lu said. He noted the “personal efforts” made by Chinese President Xi Jinping and his Philippine counterpart Rodrigo Duterte. “Thanks to the personal efforts of the two leaders, China and the Philippines have got back to the right track of properly handling and resolving the relevant disputes through negotiation and consultation,” he said. “Steady progress has been made in the consultations on the COC [Code of Conduct],” he said. “China-Philippine relations have been turned around, consolidated and elevated to the comprehensive strategic cooperative relationship. Lu said Beijing was hoping that the Philippines would join them in strictly implementing the important consensus reached by the two leaders on properly resolving the South China Sea issue and safeguarding peace and stability in the South China Sea.